28 (30, 32, 34, 36, 38, 40)" bust (with stretch to fit snugly with up to 4" negative ease). The trouble with these tribbles is deciding which retro vest to make! 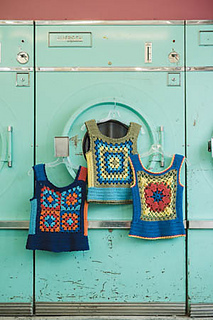 Vintage-inspired, with a contemporary attitude toward fabric, fit, and drape, these adorable no-sew vests are exceptionally fun to wear and jolly good canvases for playing with color. The body squares are interchangeable and have shared assembly instructions, so you can mix and match. For Granny Square vest: #12 lake (A), 2 (2, 3, 3, 3, 4, 4) skeins; #11 sage (B), 2 (2, 2, 3, 3, 3, 3) skeins; #21 lemon drop (C), 1 (1, 2, 2, 2, 3, 3) skein(s); #14 colonial blue (D), 1 skein. For Flower Motif vest: #14 colonial blue (A), 2 (2, 3, 3, 4, 4, 5) skeins; #3390 persimmon (B), 1 (1, 1, 2, 2, 2, 2) skein(s); #21 lemon drop (C), 1 (1, 2, 2, 2, 2, 2) skein(s); #11 sage (D), 1 skein. For Four-Patch vest: #14 colonial blue, 1 (1, 2, 2, 2, 2, 2) skein(s); #3390 persimmon, 1 (1, 2, 2, 2, 2, 2) skein(s); #12 lake, 1 (1, 2, 2, 2, 2, 2) skein(s); #07 ginger, 1 (1, 2, 2, 2, 2, 2) skein(s); #15 navy, 3 (3, 3, 4, 4, 5, 5) skeins. GAUGE 14 sts and 8 rows = 4” in main body patt (alternating 1 sc row, 1 dc blo row); 3 rep = 31/4” in granny st (3 dc, ch 1). To check your gauge, work body motif of your choice and use the checkpoint measurements listed at the end of each rnd.